← Bloomberg’s Awful Comment; What Can We Say For Certain Regarding the GSEs? 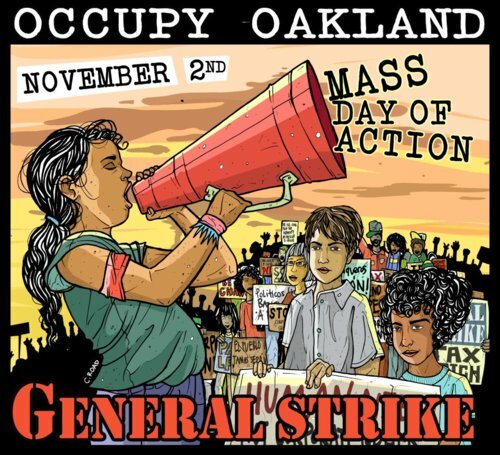 I can’t embed scribd, but please check out the Occupy Oakland Tribune, Today’ss General Strike edition. According to Walter Benjamin (who himself is drawing from Georges Sorel), there are two essentially different kinds of strikes. In the political strike, partisans withhold labor, with the hope that their action—which interestingly is an omission of action—will cause an employer to make certain concessions that the strikers have specified beforehand. Because it is assumed that participants are ready to resume work once certain demands have been met, the strike can be thought of as the means to a determinate end (usually some form of material gain). By contrast, the general strike is what Benjamin describes as “pure means.” Such an action differs from the paradigm of political activity that seeks only immediately practicable goals—like wage increases, health benefits, and certain modifications to the workplace. The premise of the general strike is this: work will not resume once this or that concession is made; instead, people will show their “determination to resume only awholly transformed work” [my italics]. In a characteristically wonderful phrase, Benjamin writes that the general strike “not so much causes as consummates.”…. Although the defense of public education may seem a remote or peripheral concern of the occupy movement, the connection between the two is indisputable. There is a financial pipeline that travels from public universities directly to Wall Street, and what is trafficked through this pipeline is not anything positive—rather it is debt…Nietzsche reminds us that the relationship between creditor and debtor depends on the wager of the body as collateral. The creditor lends what the borrower does not have. As a guarantee of repayment, the debtor agrees that in the event of default, the lender can inflict harm on the body as method of compensation. Although the workings of this principle of exchange have become abstract, and even spectral—at root, the economy still operates in quite the same fashion. Those who lack resources are forced to take out loans in order to provide for basic needs, like education, all while the cost of these basic needs becomes increasingly prohibitive; as a result of this unwise, but necessary borrowing, bodies are put on the line (the working body that can never seem to catch up to the interest that it owes; the sleeping body that is displaced from its shelter). There have been some fascinating posts getting at a theory of what is happening in the protests. Here’s JW Mason using Arendt’s “On Revolution” as a guide to the organization (do I need to read that book? – it has been recommended). Here’s Suresh Naidu using Acemoglu and Robinson’s formal political economy theory of democratization to understand the occupiers. In case you missed it before, Peter Frase on the way elites blur ideology and partisanship. Great post (he’s been on a roll lately). Also Gordon Lafer on Why Occupy Wall Street Has Left Washington Behind. n+1 has put out an Occupy Gazette, featuring some of the best writing on the occupy movement so far. My piece on the 99% Tumblr analysis made the cut. Check it out! Shame on the New York Times and NPR for firing or refusing to use contractors who have stood with the 99%. Corey Robin has more on this Fear, American Style – or private sector political repression. My college girlfriend now works in a warehouse, too, as a supervisor—in a quieter, sadder warehouse, where people ship merchandise for big online companies everyone has heard of but that can’t be named here… “Hold on, I gotta fire somebody real quick,” she says, picking up the phone. She calls a man who’s been working for her for two months. She’s sorry, she tells him, but she has to let him go because one of the supervisors caught him talking on the floor. The man, who she thinks is in his late 40s or early 50s, protests that he only asked a new guy where he was from. That’s just not the culture, Susie tells him. You know the rules. The logistics company sets them, and she has no choice but to enforce them. Gives a whole new meaning to freedom of speech. Irin Carmon, who has moved to Salon (smart move by Salon), reports on The next front in the abortion wars: birth control, and the personhood movement taking off in Mississippi. Also – New York Magazine has an article about the feminist blogosphere – The Rebirth of the Feminist Manifesto. As others have pointed out, it is good to see a story where women are the young renegades and troublemakers on the internet, changing the rules on the establishment, etc. Is there good general strike music? Isn’t “Which Side Are You On?” the quintessential general strike music? On the Lafer piece, there is a general tendency right now to claim that the Occupy movement will never be associated with a legislative agenda because they have all realized “the system” is irredeemably corrupt and can’t be reformed through electoral politics and legislation. I don’t buy that, and I believe that as 2012 evolves, we will indeed see a clear and very ambitiously progressive, and even radical, legislative agenda take hold that is shaped and ultimately endorsed by the Occupy movement.. The idea that the system is too broken to be fixed electorally is based on the idea that money rules electoral politics, and there is no way to take that money out of electoral politics. But the whole reason money plays a role in electoral politics is that getting elected requires a mass communication effort, and money buys access to the standard means of communication and travel. Can OWS take the money out of politics? They are already succeeding in doing just that. Each day, they succeed further in speaking over and around the gatekeepers of the mass media. It is not to far-fetched to believe that by the summer of 2012, many tens or hundreds of millions of Americans may be getting their information through online access to publications such as “the Occupy Oakland Tribune”, or through local Occupy chapters that are even now in the process of spreading out from the large cities, to small cities to towns. There is nothing wrong with this country that can’t be fixed by throwing out each and every millionaire member of Congress, and replacing him or her by a right-thinking progressive from the 99%. If we get two vigorously progressive houses of Congress, the transactions tax will just be the smallest of changes on the table. We can get radical transformations of corporate governance and workplace rules, a much more egalitarian income and compensation system, a national full employment program, a public sector banking system, a publicly run health care system and an expanded public sector program for building up and democratically controlling our national infrastructure. Screwed up signing up for an email follow request! Could you send another? I was just out at the Oakland General Strike all morning and most of the afternoon and as I was about to head home for a while a giant semi emblazoned with Teamsters District 7 and solidarity slogans blasting Dave Alvin’s (I think) rock-and-roll version of Which Side Are You On super-loud drove up onto the civic center plaza. Very cool. The actions were great – great vibe, militant but peaceful, all of the kinds of Oaklanders. Looking to be a major success and setting a path toward bringing the city together behind the movement after a nightmarish week. Hesitate to speak too soon, since the day isn’t done, but I didn’t see a single cop. Zero. Finally somebody at City Hall has their head screwed on a little bit. Yes- read Hannah Arendt !